Gaming represents more than one in four Nevada jobs. During fiscal year 2018, the tourism industry directly employed 282,600 workers in Nevada. The impacts of the tourism industry go well beyond simply jobs in the hotel-casino properties. They also include other leisure and hospitality positions supported by visitor spending in other parts of the economy such as retail employees and other industry-related positions. To understand the importance of the tourism industry to Nevada's economy, it is critical to consider the indirect and induced effects the industry has throughout the state. Indirect impacts are secondary impacts attributable to purchases made by an industry's supplier of goods and services. Examples of indirect impacts would be jobs created at a slot machine manufacturer as a result of a casino purchasing new gaming machines, or agricultural jobs created by the purchase of fresh ingredients for a restaurant. In 2018, indirect employment accounted for 68,800 jobs throughout Nevada. Finally, induced impacts sourced to the tourism industry must be considered when taking into account the overall economic impact of the sector. Induced impacts are generally defined as impacts from purchases made by employees who work directly for the tourism industry. Examples of induced employment impacts include activities such as a hospitality employee buying groceries at a store or going to the movies. Induced impacts accounted for roughly 98,600 jobs during fiscal year 2018. Indirect and induced impacts are often referred to as the "ripple effect." On a combined basis, direct, indirect and induced employment impacts from Nevada's tourism industry resulted in the support of roughly 450,100 jobs during the year. During the better part of the last decade, the leisure and hospitality sector has supported continued growth in the local economy. Employment gains in the industry have slowed in recent years with relatively limited ground-up development of new resort properties. Investments have been focused on maintenance and upgrades to existing facilities, along with enhanced service levels. Importantly, investments in non-gaming amenities have resulted in more "hospitality" employees, while those in more traditional gaming-related positions are shifting. With a number of large-scale projects in the development pipeline, the sector is expected to experience continued growth. Importantly, businesses generally also continue to seek out opportunities to streamline operations and implement automation strategies where appropriate. The hotel-casino industry is no different. The following page provides examples of how resorts continue to innovate. Source: U.S. Bureau of Labor Statistics; Not Seasonally Adjusted. Note: Fiscal years represented. Employment in Nevada's leisure and hospitality sector grew by approximately 16,400 jobs (+4.8%) since 2008, while total employment grew by 103,100 jobs (+8.1%). During this same time period, the sector that reported the largest net jobs growth was education and health services, which has added 42,300 jobs (+43.7%) over the last decade. 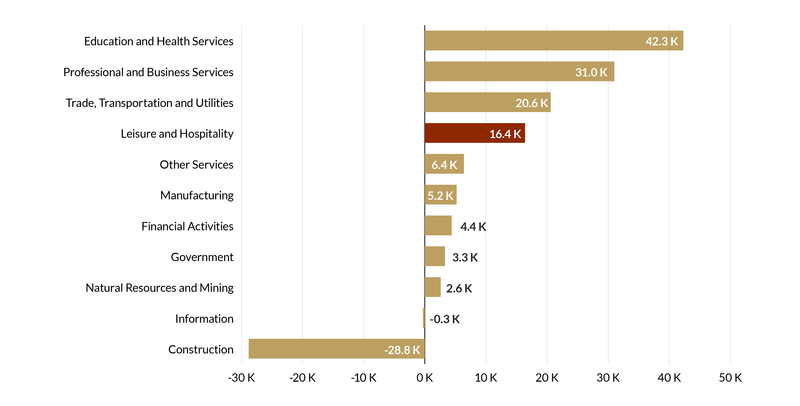 Other notable sector growth includes the professional and business services sector (+31,000 employees) and the trade, transportation and utilities sector (+20,600 employees). Nevada's construction sector remains 28,800 employees short of the sector's reported employment during fiscal year 2008.